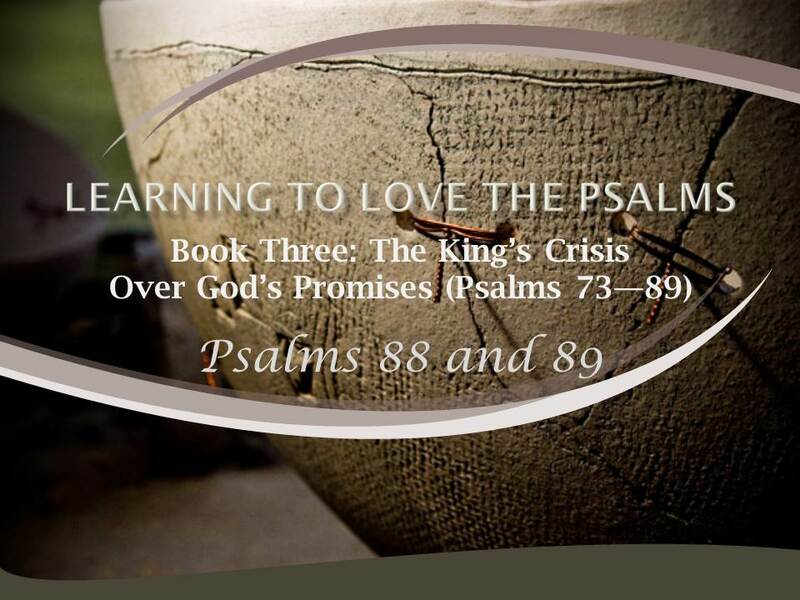 Psalms 88 and 89 conclude the third book of the Psalter with an especially intense expression of the crisis of faith that dominates this book. They were written by two authors who are little known to us, but who are apparently leaders in groups of musicians that were established in David’s day, (1 Chronicles 6:31-47). Psalm 88 expresses the crisis in very individual terms while Psalm 89 shows the national significance of Israel’s confusion and suffering. Psalm 89 begins on a positive note about God’s promises to the nation. The psalmist wants everyone to know how good and reliable the Lord is: “I will sing of the steadfast love of the Lord, forever; with my mouth I will make known your faithfulness to all generations. For I said, ‘Steadfast love will be built up forever; in the heavens you will establish your faithfulness,’” (vv. -2). The specific focus of that faithfulness, sure as Heaven itself, is the promise that God made to David: You have said, “I have made a covenant with my chosen one; I have sworn to David my servant, I will establish your offspring forever, and build your throne for all generations,” (vv. 3-4). Here are promises that echo through various psalms and throughout the Old Testament. The center of this psalm continues to point to this promise, as a strong confession of faith is put on the lips of David: “You are my Father, my God, and the Rock of my salvation,” (v. 26). This psalm in its confidence even considers the possibility that David’s sons will not be faithful as David was faithful. “If his children forsake my law and do not walk according to my rules, then I will punish their transgression with the rod and their iniquity with stripes, but I will not remove from him my steadfast love or be false to my faithfulness. I will not violate my covenant or alter the word that went forth from my lips,” (vv. 30, 32-34). Chastisement may follow on sin, but God promises unfailingly to preserve David’s line forever. The intensity of the confidence in verses 1–37 makes the second part of the psalm surprising and arresting. Suddenly, the psalm turns: “But now you have cast off and rejected; you are full of wrath against your anointed. You have renounced the covenant with your servant; you have defiled his crown in the dust,” (vv. 38-39). The psalm turns from praise to lament and prayer for help. With the confusion and distress of Psalm 89 in mind, we can turn back to Psalm 88. Its language is such that it could be the lament of any one of God’s people. But in its context, it must also be the lament of the king. After the exalted vision of Israel as the center and life of the nations of the world in Psalm 87, the apparent failure of the covenant in Psalm 89 would certainly explain the profound lament of Psalm 88. Psalm 88 is the bleakest psalm in the whole Psalter. Here is the crisis of faith at its deepest. Here, the cry of Psalm 22 – “My God, my God, why have you forsaken me?” – has no answering confidence in the future as we find in that later part of Psalm 22. The only note of faith in Psalm 88 is the confession at the beginning, “O Lord, God of my salvation.” The only bit of hope is in the fact that the psalmist is praying. The lament is deep and bitter indeed: “I am counted like one set loose among the dead, like the slain that lie in the grave, like those whom you remember no more, for they are cut off from your hand. O Lord, why do you cast my soul away? Why do you hide your face from me? Your wrath has swept over me; your dreadful assaults destroy me. 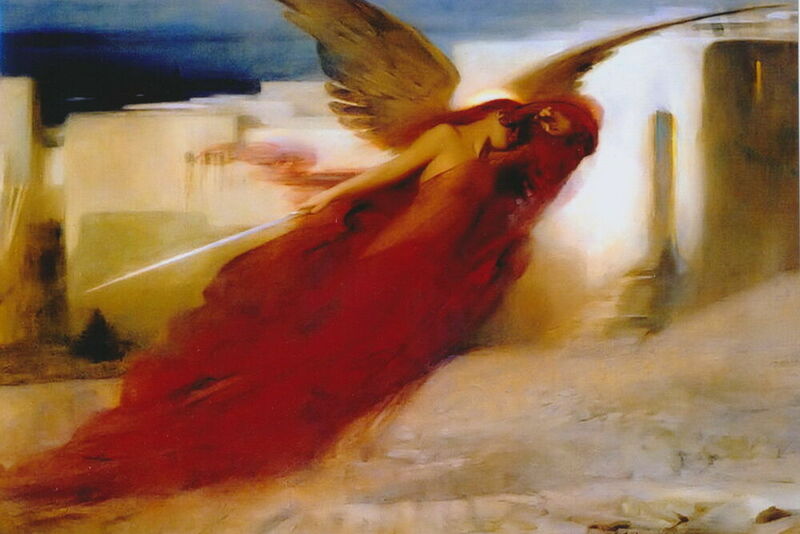 You have caused my beloved and my friend to shun me; my companions have become darkness,” (vv. 4-5, 14, 16, 18). Lifelong suffering is his lot: “Afflicted and close to death from my youth up, I suffer your terrors; I am helpless,” (v. 15). This cry of the heart should remind us that those who follow God may have times of the most intense suffering and of feeling abandoned by God. The Christian must always bear his cross. Jesus said, “If anyone would come after me, let him deny himself and take up his cross and follow me. For whoever would save his life will lose it, but whoever loses his life for my sake will find it,” (Matthew 16:24-25). The Christian is always groaning inwardly: “We ourselves, who have the firstfruits of the Spirit, groan inwardly as we wait eagerly for adoption as sons, the redemption of our bodies,” (Romans 8:23). And the Christian is always struggling against sin and the forces of evil: “For I do not do the good I want, but the evil I do not want is what I keep on doing,” (Romans 7:19). Conflict exists in our own nature: “For the desires of the flesh are against the Spirit, and the desires of the Spirit are against the flesh, for these are opposed to each other, to keep you from doing the things you want to do,” (Galatians 5:17). Psalm 88 expresses our feelings when the cross is especially heavy and the struggle at its most difficult. By giving expression to our most bleak feelings, Psalm 88 comforts us in a curious way. It shows us that we are not alone in our doubts, confusions, and complaints. Not only have other believers felt the same things, but God has inscripturated those sentiments to assure us that it is legitimate to feel such things and to pour them out in prayer. As the prayer of the king, Psalm 88 also expresses the nadir of Israel’s life. In this sense, Psalm 88 is a prayer that expresses the suffering of Jesus, especially as he prayed in Gethsemane and on the cross. Here again, we see how Jesus took up the sufferings of his people. This psalm amplifies what it meant for him to be forsaken of God and man. As Jesus takes up our suffering, he also answers our questions about whether God has kept his promises to David. Jesus is indeed the everlasting King of the line of David. The third book of the Psalter ends with praise: “Blessed be the Lord forever! Amen and amen,” (Psalm 89:52). But it also ends with very distressed and, for Israel in the Old Testament, unanswered questions. Book Four will make clear how the Psalter begins to answer those questions that arise from the loss of king and temple. In what ways does Psalm 89 begin on a positive note about God’s promises to the nation? Why is this significant? Why is Psalm 88 considered the bleakest psalm in the whole Psalter, while at the same time it is curiously comforting? Why do we need continual reminders that those who follow God may have times of the most intense suffering and of feeling abandoned by God? The third book of the Psalter ends with this praise, “Blessed be the Lord forever! Amen and amen.” Describe a time when you had a similar praise and blessed the Lord because of it.